Engaging with immigrant communities is on many museums’ minds. Over the last few months, we’ve highlighted different programs (e.g. at the Buffalo History Museum and CelebrARTE at the DAM) and frameworks (e.g. 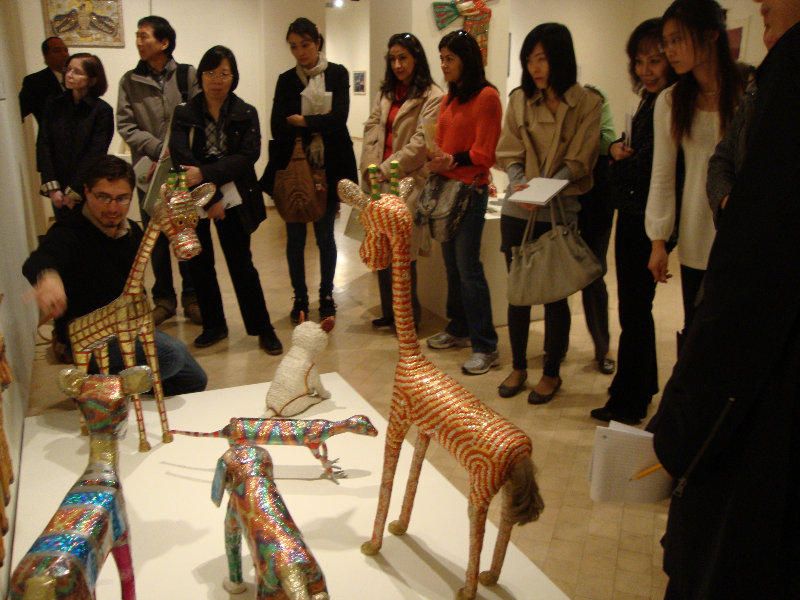 Intercultural Dialogue) museum professionals are using both nationally and internationally. Today, we wish to bring attention to CALTA21 (Cultures and Literacies through Art for the 21st Century), an initiative aimed at bridging Immigrant English-Learners and museums that is funded through a National Leadership Grant from the Institute of Museum and Library Services (IMLS). While currently based in New York State, CALTA21 is looking for museums across the U.S. to implement its model (any takers?). Thanks to our guest blogger Patricia Lannes, Founder and Project Director of CALTA21. There appears to be broad consensus amongst museum professionals that museums must do more to promote social inclusion. Despite the proliferation of outreach programs intended to engage “non-traditional” museum audiences, the museum-going population continues to become an increasingly less-diverse group. This is problematic when one considers that minorities currently constitute only 9% of museums’ core visitors and that “within four decades, the group that has historically contributed the core audience for museums—non-hispanic whites—will be a minority.” (Farrell, 5) Developing effective strategies for engaging new audiences is thus a task of existential importance, and museums are beginning to develop effective ways to achieve this. If we understand our goal as being the promotion of life-long engagement with members of diverse groups, what sort of framework and programming can we develop and institute to help achieve this? One answer is to develop programs that seek to eliminate or reduce structural obstacles to museum attendance. In the context of immigrant communities, this approach might call for tours and labels in languages other than English, improved transportation between immigrant communities and museums, or free admission programs. There is no question that promoting access will help drive engagement with individuals independently interested in visiting the museum, but prevented from doing so by some tangible obstacle. Efforts like these cannot, however, engage segments of the population that are unaware of the resources the museum has to offer. If we are to engage this larger group, we must develop mechanisms that serve as bridges to communicate the value of these resources. Another way to do this might be to support programming that directly relates to these groups’ cultural and social backgrounds. We might, for example, call for an exhibit to display objects from immigrants’ homelands and cultures, or an event to celebrate El Dia de los Muertos. Although these efforts would certainly help correct the historical under- and mis-representation of minority groups in our cultural narrative, it is misguided to think that immigrant and minority communities have little interest in museums because museums offer nothing of direct relevance to their lives. The mistake in this reasoning hides the assumption that an audience is “automatically interested only in objects that are directly related to its cultural background” (Bodo). Efforts to promote diverse cultural programming may have value in their own right, but they are insufficient to engage all audiences. The diversity presented within immigrant communities renders powerless any attempt to engage members of these communities on the basis of any single ethnicity or culture. While the museum’s exhibits might be, in a narrow sense, collections of culturally-specific objects, this need not prevent them from having universal appeal. These objects can have broad appeal (despite their cultural-specificity) if we recognize that they address issues and emotions that are universally shared. The 10 unit CALTA21 curriculum we have developed presents one example of how the above principles can be used to guide engagement with immigrant audiences. It begins by placing the adult English-language learner at the center of the initiative, not as a recipient or subject but as an agent and stakeholder. Instead of emphasizing the information that the museum has to share with the viewer, the curriculum stresses the value of the knowledge that every participant already possesses. The discussions that ensue are based loosely on the curriculum’s thread of “Identity and Portraiture”, but are ultimately structured and guided by whatever it is that the participants decide is important to mention and discuss. It uses an inquiry-based approach that relies on open-ended questions rather than specific talking points; each viewer is invited to look and identify his or her own point of entry into the discussion. When the value of each individual’s experiences and opinions is emphasized in this way, the hierarchical flow of information represented by the traditional student-teacher relationship is subverted and replaced by an egalitarian exchange of ideas. At El Museo Del Barrio, an educator leads a VTS tour with ESOL students. Photo Courtesy: Patricia Lannes. These exchanges empower participants by validating the value of their own cultures, stories, and experiences, while simultaneously validating the cultures of other participants and of their newly adopted community. In other words, the experience of participating in these discussions is empowering and engaging not because it bequeaths the participants with some essential knowledge that they previous lacked but rather because it demonstrates the value of communicating one’s own opinions, stories, and experiences. Engaging in intercultural dialogue in this way fosters real reciprocity “between the museum and its diverse audiences, by bringing into dialogue their different perspectives, experiences, and knowledge bases and providing everyone with genuine opportunities for self-representation and collaborative ‘meaning-making’” (Bodo). These discussions are thus ultimately capable of initiating what Simona Bodo so aptly refers to as “new knowledge systems, relationships, and interpretive communities” (Bodo). There’s a danger here of viewing the museum’s role in this intercultural dialogue as secondary or incidental; if the museum’s deep understanding of art and culture is ultimately of little importance, what is special about the museum context? Can’t these sorts of intercultural exchanges take place in any public setting? Intercultural exchange isn’t limited to the museum context, but the art museum experience is central in that it presents the visitor with the visual art that serves as such a powerful and universal catalyst for dialogue. This is especially so for the adult English language learner immigrant; because art relays information to the viewer visually, it eliminates the need for a mediating language that must be mastered before the viewer can form opinions about the work. Using visual perception, viewers access higher-order critical thinking skills directly in their preferred language. Collective knowledge ensues and teachers and museum educators are facilitators with the role of supporting the student’s English language communication skills. It may go without saying, but realizing meaningful intercultural dialogue within the museum context depends on coordinating the needs and efforts of many individuals and institutions. In the case of CALTA21, this was achieved largely via professional development institutes that convene museum professionals & English language instructors to prepare them to jointly implement the CALTA21 curriculum in their classrooms and museums. The professional development institutes are an important way for us to communicate the CALTA21 model to the participating educators, but they also serve as a forum for discussing best practices and the varying needs of different constituents and for forging lasting cooperative partnerships. The success of these partners in leveraging the collective power of their institutions to empower adult immigrants through intercultural dialogue depends on the benefits derived by all participants. The professional development institutes are also integral because they present an opportunity to solicit feedback from the program’s participants. This feedback allows us to make critical course corrections along the way and make sure we are most effectively serving the needs and desires of all program participants. 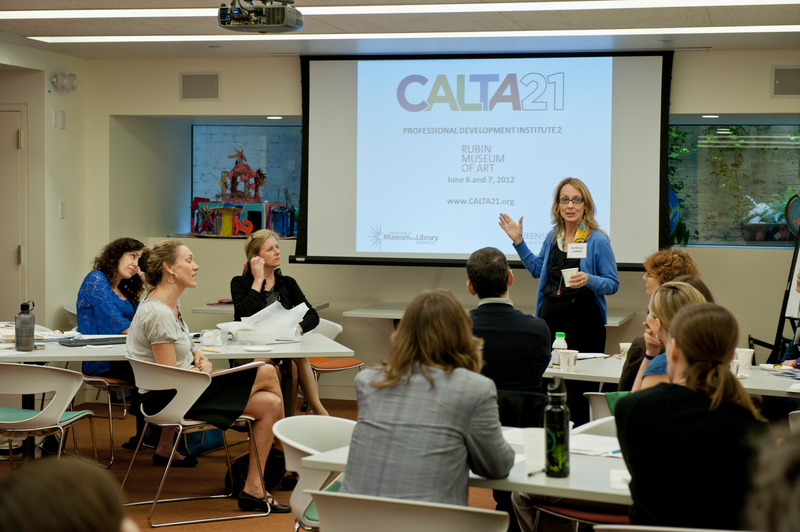 Patricia Lannes introducing CALTA21 to a group of professionals at the Rubin Museum of Art. Photo Courtesy: Patricia Lannes. Supporting cooperative relationships amongst diverse groups and institutions is thus an important component in achieving our goal of creating inclusive museums, but it is more than this. Building these cooperative relationships is the natural extension of the principle that bringing into dialogue different perspectives, experiences, and knowledge bases provides an opportunity for greater understanding through collaborative meaning-making. Calta21’s emphasis on collaboration is thus partially pragmatic (how else could we get so many diverse actors to work together towards a shared goal? ), but it’s also foundational and based on the idea that cooperation is valuable for its own sake. Just as intercultural dialogue provides opportunities for creating new meaning amongst people of different cultures, programming that promotes inter-institutional dialogue and cooperation can ultimately give rise to new pedagogies and ways of understanding. It’s important to note that the CALTA21 initiative’s greatest value lies not in the details of its structure, but in its general framework. CALTA21 is successful not because it has developed a particular curriculum or methodology that’s essential to the goal of accessibility, but rather because it is built on a foundation that seeks intercultural dialogue, full cultural participation, and civic engagement. CALTA21’s legacy is thus not just the particular curriculum or programming it has developed and delivered, but also the demonstration of the value of rethinking the pedagogies that serve as foundations for any initiative or program. Bodo, Simona. “NEW PARADIGMS FOR INTERCULTURAL WORK IN MUSEUMS – OR INTERCULTURAL WORK AS A NEW PARADIGM FOR MUSEUM PRACTICE? PART II.” The Incluseum. N.p., 29 Apr. 2013. Web. 10 May 2013. Crandall, Joann, and Ken Sheppard. 2004. Adult ESL and the Community College. New York: Council for Advancement of Adult Literacy. Farrell, Betty, and Maria Medvedeva. 2010. Demographic Transformation and the Future of Museums. Washington, D.C.: American Association of Museums. Patricia Lannes has worked in the fields of visual literacy and museum education for over 20 years. She is the Founder and Project Director of CALTA21 (Cultures and Literacies through Art for the 21st Century), a model initiative funded by an Institute of Museum and Library Services National Leadership Grant. Prior to becoming the Project Director of CALTA21, she was Director of Education at the Nassau County Museum of Art, Roslyn Harbor, NY. A native from Uruguay, she holds a degree in History from the Universidad de la Republica, Uruguay and is the chair of the Latino Network, a professional interest committee from the American Alliance of Museums. She addresses issues of visual literacy, intercultural understanding, diversity, civic dialogue, community outreach and institutional partnerships at local, regional and national conferences. You can contact email Patricia (Lannespatricia@gmail.com) or call her at (516-313-1091). Very cool! And what’s even more cool is that not only was an image of my grandfather’s folk art while on exhibit last year at El Museo del Barrio used in the article, his work is being utilized in this program. HI Olga. I am sure you are excited to see your grandfather’s work at the museum and being used by the CALTA21 adult students. Students were very intrigued with his work and they chose it as part of their tour for their family or friends on the second trip to El Museo. Contact me at plannes@qcc.cuny.edu if you want to read some writing samples or perhaps even talk to the students. I am so excited for this project. This is exactly what I have been thinking and saying for years. This is why art museums are so important, and this is exactly why I do what I do and why I believe in museum education. Thanks, Patricia. This was inspiring, and I look forward to learning more about this program! Thanks Madalena for your enthusiasm. It is always very encouraging to get such positive comments from another museum educator addressing many of the same issues. Keep in touch and let us know how your own efforts towards these important goals develop. Thanks again!